Butsugenji is closely related to the Izu Persecution. This is the place where Nichiren Shonin was exiled. The temple is also known as the place where his small Shakamuni Buddha statue (Zuishin-butsu) rests. On a beach nearby is the famous chopping board rock (Manaita-iwa), where Nichiren Shonin was deserted to die from the rising ocean water. 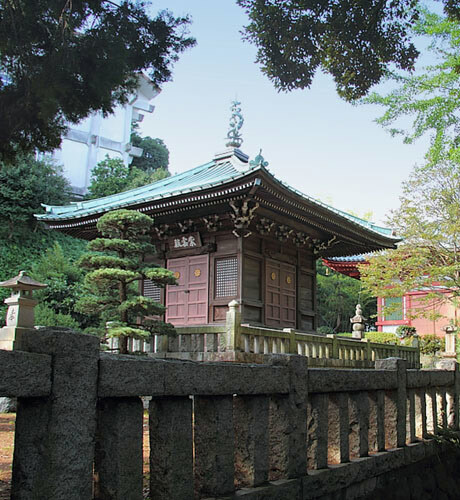 The couple who rescued Nichiren Shonin, Funamori Yasaburo and his wife, rest at Renkeiji Temple in the same region. In the spring of 1261, Nichiren Shonin returned to Kamakura from Shimousa, but he was captured and sent away to Izu. He convinced his disciple Nichiro not to accompany him and went on a boat to be taken away on May 21. The boat arrived at a rocky shore called Kawana in Ito. Yasaburo and his wife secretly took Nichiren Shonin in and took care of him. Eventually, Nichiren Shonin was sent to the local tax official, Sukemitsu Ito, to be kept under his watchful eye. Sukemitsu Ito built Bishamon-do for Nichiren Shonin to protect him. Nichiren Shonin lived there during his exile. Nichiren Shonin wrote two important treatises: “Shion Sho” and “Kyoki Jikoku Sho” there. Butusgenji was built where Bishamon-do once stood. Sanmon (Temple Gate) was built in late Tokugawa era (mid-19th century.) Soshi-do (Founder's Hall) and new Bishamon-do were built in 1951 to commemorate the 750th anniversary of Nichiren Shonin’s birth. When Nichiren Shonin was exiled to Ito, something on the bed of ocean nearby was shining day and night. People were afraid of it as a precursor of some incident. They threw a net into the ocean to retrieve the object, and a small, golden-colored statue of the Buddha standing was brought up to shore. Sukemitsu Ito happened to be suffering from unknown illness, and he asked Nichiren Shonin to pray for him. Sukemitsu was cured, and he became a follower of Nichiren Shonin. He presented the golden Buddha from the ocean to Nichiren Shonin. Nichiren Shonin cherished this Buddha and carried it with him for the rest of his life.